ADORABLE MINI VASES - Fall in love with this collection of uniquely shaped vases in equally adorable petite sizes. Vases range from 2 3/4" to 3 3/4" tall. AVAILABLE IN CLEAR OR JEWEL TONES - These darling, mini vases are available in Clear glass for a classic look, or select the Jewel Tone set for a bold and colorful statement. ECLECTIC SHAPES AND PATTERNS - The varied shapes shapes evoke a sense of timeless beauty that blends seamlessly with any decor. 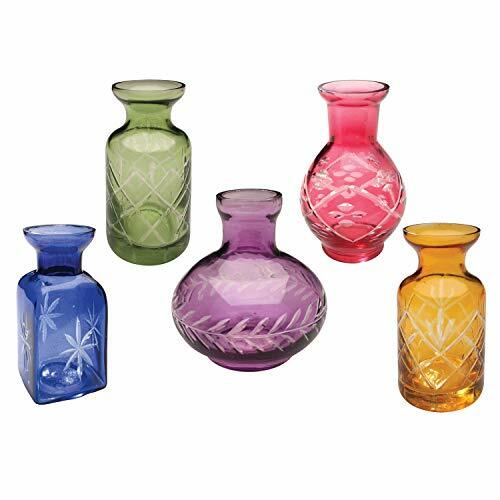 Each vase is embellished with an etched pattern to further enhance its beauty. PERFECT FOR YOUR DINNER TABLE - The cut glass designs work in tandem to create a unique centerpiece for your dining table parading down the center or position one at each place setting. MAKES A GREAT GIFT - Ideal for the Holidays, Valentine's Day, Mother's Day, and birthdays, just add a single bloom of your favorite flower.